What happens in the early morning when waterfowl of the American River wake up? Where do turtles hide? Are Egrets, Great Blue Herons and seagulls willing to share the same space on the river? Why do Cormorants hang their wings to dry? Join local author, Janice Kelley, as she answers these questions, and shares other river activities. She draws her experience from two years of watching wildlife wake up; in addition to capturing scenic views, morning fog and stunning sunrises in photos. 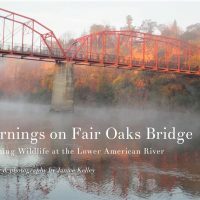 Janice will read passages from her book and share photos to provide insight into these morning experiences, and invites guests to share their river stories.